In Turkish cuisine, bulgur, better known as ‘cracked wheat,' is a staple and one of the most common ingredients found in Turkish pantries. Bulgur is used in everything from main courses and side dishes to desserts. Bulgur is also used as a binding agent in many meatball recipes like ‘İzmir köftesi.’ Pilafs made with bulgur rather than rice, such as bulgur and vegetable pilaf, are favorites alongside grilled meats and poultry. You’ll find delicious tomato-y bulgur pilaf as the side dish of choice in many kebab restaurants. There are also many ways to use bulgur in cold salads. Bulgur and fresh herb salad and bulgur salad with pomegranate seeds and mint are only some examples of newer ways to use bulgur. These recipes make wonderful side dishes at barbecues and other hot weather meals. They are also popular with health-conscious folks looking for dishes with healthy carbs and less oil. Another great bulgur salad to enjoy during the hot summer weather is a salad made with summer vegetables and herbs like summer squashes, vine-ripened tomatoes, and fresh basil. It’s not only fresh and good for you, it’s also colorful and festive enough for company. The best part is that you can make it ahead of time as it stores well in the refrigerator. 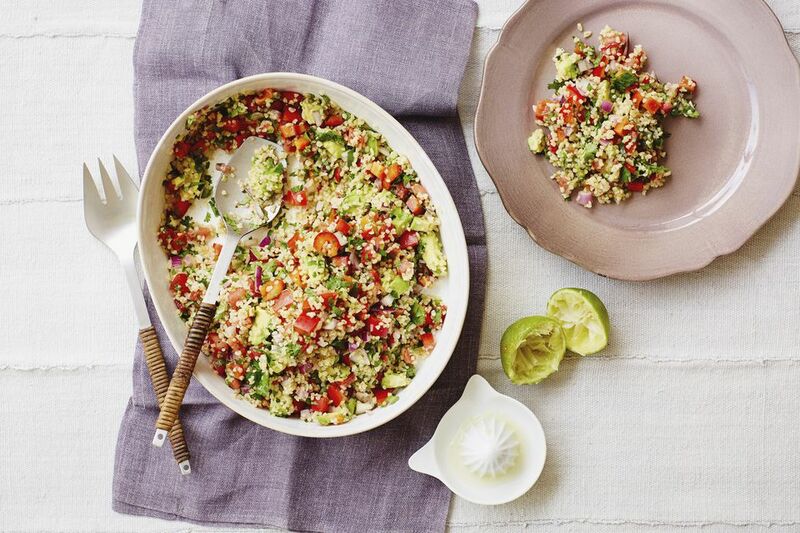 Try this easy recipe or any other cold bulgur salad recipes at your next barbecue or get together. Your family and guests will be glad you did. In a large saucepan, add the bulgur, water, and salt and bring to a boil. Reduce the heat and cover the pan. Let the bulgur simmer gently until all the water disappears. Turn off the heat and let the bulgur continue to steam and cool down. In the meantime prepare your vegetables. Wash and dice the squash, and cut the tomatoes in halves or quarters depending on their size. Wash the basil leaves and pinch off the stems. In a skillet, heat the olive oil and saute the diced squash for a few minutes until slightly softened. Set aside and let it cool. When the bulgur is completely cool, use your fingers or a wooden spoon to separate the grains. Add the salt and toss it through. Add the olive oil and work it through all the bulgur evenly. Add the cooled chopped vegetables and toss them into the bulgur gently but thoroughly. Add the basil leaves and again, toss them through. If the basil leaves are very large, you can tear them into smaller pieces before you add them.